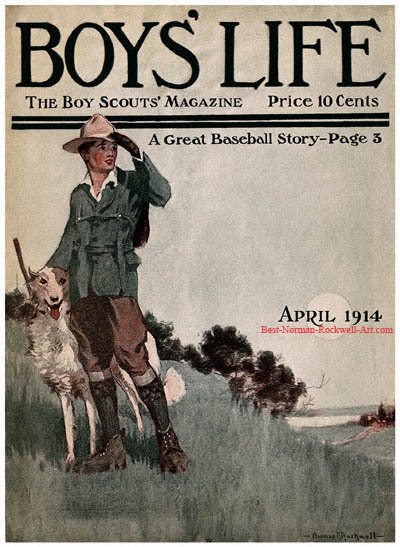 Scout with Dog on Hill, this Norman Rockwell painting, appeared on the cover of Boys' Life published April 1914. This event marked Rockwell's eighth cover publication. Even before the Boy Scouts magazine published this painting on its cover, readers had already become familiar with his art through his article and story illustrations. Rockwell had been the art director of Boys' Life since being hired for the position in 1913. This was the 18 year old Rockwell's first job with a magazine. Boys' Life was a fairly new publication at this time. The first issue was published in 1911. Undoubtedly, its early success was in large part due to its fine young art director. A Boy Scout often goes hiking. Here we find a Scout off for a hike with his dog. Judging by the distance from the town in the background, he has already made a good start on his hike. From his vantage point on this hill, he can see where he has already been and where he is going. No Scout should hike alone. He is taking his dog with him on this hike. The dog is a tall one. Can anyone fathom a guess as to the dog's breed? Rockwell depicts this adventurous scout all decked out. He is wearing a jacket, hiking boots, gloves and hat. He has his pack on his back. He appears to have a walking stick in his right hand.